Villa Malee Sai certainly checks off all the right boxes as a seaside holiday home: it places guests at a prime location along Natai Beach, and offers direct beach access along with sweeping sea vistas. The environment is serene and tucked-away - just right for a restful vacation with friends and family. These perks, combined with amenities like a personal chef service, a glass-walled dining room, state of the art Teatro entertainment system and spa room, guests will find that there’s little reason to leave the villa at all during their stay. Six capacious bedrooms comfortably accommodate 12 guests at Villa Malee Sai. Two of the three master suites offer views out to the ocean, as well as direct access to a terrace. Two of the guest bedrooms are kitted out with twin singles, while the third is a study bedroom with a plush king bed. Step outdoors to a 25-metre saltwater infinity pool overlooking the ocean. 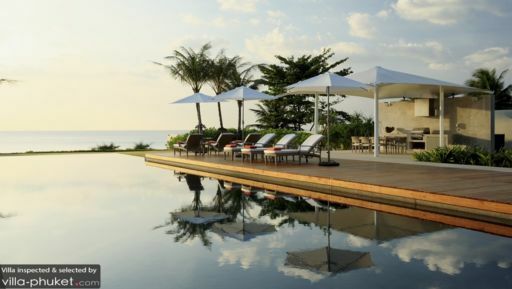 A teak sun deck flanks one side of the pool; furnished with recliners and sun umbrellas, it’s the perfect spot for soaking up the breezy Phuket vibes while taking in glorious sunset views. A sala equipped with a 12-seater dining set offers an ideal setup for alfresco dining experiences. Post dinner, shift over to the beachside pavilion, where you can lounge comfortably while sipping cocktails under the starry night sky. 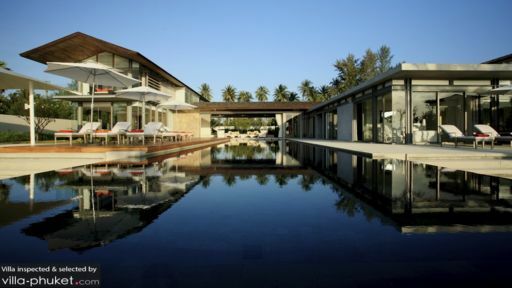 The living spaces at Villa Malee Sai are best described as stylish, contemporary and cosy. Designed to make the best of its postcard-pretty surroundings, the home features glass walls, indoor-outdoor living spaces that open out to the pool and a neatly manicured lawn that extends out towards the coast. You’ll enjoy uninterrupted sea vistas while dining indoors, lounging upon plush sofas in the living room and cooking up a storm in the fully equipped kitchen. Additional amenities include a spa room and petanque court. Airport transfer (arrival only), bicycles, daily breakfast service, personal chef service, housekeeping service, personal guest service and security service are included with your stay. The villa provides kid-friendly amenities; a baby cot and high chair are available free of charge, while child minders can be engaged at additional cost. Car rental, personal driver service, in-villa massages, as well as in-villa lunches and dinners are charged at additional cost. 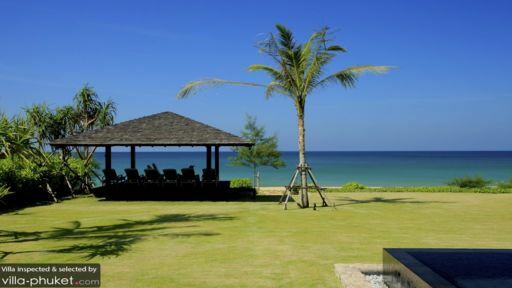 Villa Malee Sai is located along Natai Beach in North Phuket. Unlike the bustling, tourist-populated areas along the western and southern coastlines of the island, the north isn’t as widely visited; it’s quiet and peaceful, and doesn’t offer as much variety in terms of dining or nightlife attractions. But that’s perfect if what you’re seeking is a restful getaway, with easy access to unspoilt nature and an array of cultural and nature sites. Popular attractions in the vicinity include Ao Phang-nga National Park, home to the iconic James Bond Island, the Muslim sea gypsy village of Ko Panyi, mangrove forests and hongs (collapsed cave systems). Hike through the snaking trails of Raman Waterfall Forest Park or Sa Nang Manora Forest Park, visit the cave temple of Wat Suwan Kuha or take in incredible panoramas from the peak of Samet Nangshe Viewpoint. The dining scene in Natai isn’t as wide-ranging compared to the more popular, oft-visited parts of the island - yet you’ll find a decent selection of cafes, casual eateries and fine dining restaurants. We’d recommend dining out at akyra Beach Club, Esenzi, The Natai Restaurant and Co-Sea House Thai Food & Beverage.